We walk in the space; faster; our hands in the air. There are so many people but we avoid collisions. Standing, we use a foot: squashing grapes – pushing with the ball of our foot, rolling our foot, finding the possibilities of contact with the ground – sides, back, front, top. Repeat for both feet. Partner work: we take the foot of a partner who is standing while the other is kneeling: it’s like Cinderella (standing) and Prince Charming (kneeling) jokes Yochai! The person standing – Cinderella leads the movement – finding the possibilities of movement and balance; drawing in the air. 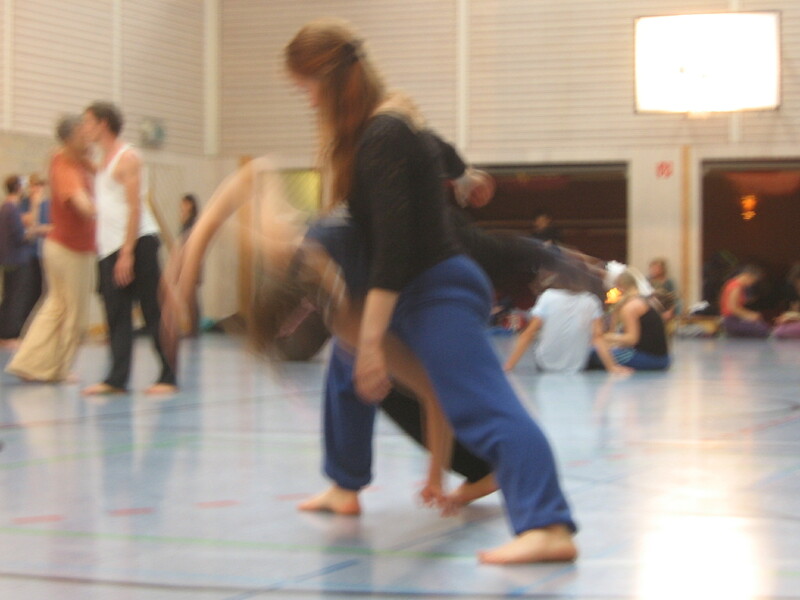 The dancers swap their positions/ roles and repeat the exercise. Now the kneeling person – the Prince – leads, manipulating the foot of Cinderella and moving her. She changes her stance in response and the Prince assists her into handstands; he can create a ‘stirrup’ with his hand and lift her foot; with their knee raised then he can take her weight and lift them! Cinderella flies! The dancers swap their positions/ roles and repeat the exercise. Spin on our right foot; slide right foot to ground; right foot over in arch – back to floor; right foot under and change feet – hop; hands on ground – handstand; feet over! In this duet, there are two roles – one which Olivia takes and one which Yochai takes. We will learn several parts to this routine although we learn them in a different order to that performed! I take Olivia’s role in the duet. Yochai stands behind Olivia; his right foot comes forward creating a ‘bench’ with his thigh that Olivia can pivot over at her left pelvis with hands going to the ground over Yochai’s thigh. Yochai starts this movement of Olivia over his thigh with his hands on her shoulders (he is behind her), guiding her to assist in movement. Once Olivia is over Yochai’s bench-like thigh and on all-fours then Yochai slides over the her back in a Capoeira like movement and offers his right foot to her which she rotates – thus rotating his body; Olivia pushes the leg so it is folded and her hand becomes a stirrup which assists in lifting Yochai so that she is stood and rotates herself (and him – who’s carried) anti-clockwise so that Yochai is standing to Olivia’s right side with their sides in contact. The next movement reminds me of Argentine tango. Olivia puts her weight on her left foot, and wraps her right leg around Yochai who then takes her weight and lifts her round him. She then steps back and offers her thigh – like a bench – to Yochai who uses it to rotate his upper body while his weight/hands are on her thigh.